ST. GEORGE – New mapping of the Riggs and Lonely fires shows both fires have increased in size to a combined 650 acres. According to a press release from the Color County Interagency Fire group issued late Wednesday, aerial mapping of the Riggs Fire estimates it to be at 450 acres, with the nearby Lonely Fire having grown to 200 acres. 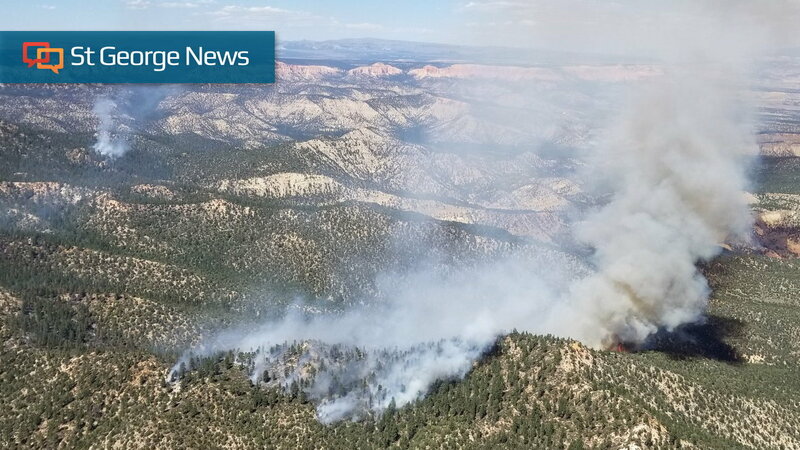 Both fires are burning in parts of Bryce Canyon National Park, the Dixie National Forest and public land overseen by the Bureau of Land Management Kanab field office. Both fires were started by lightning strikes, with the Riggs Fire igniting around Aug. 25 and the Lonely Fire igniting Monday. The Lonely Fire is located 1.5 miles north of the Riggs Fire. According to the press release, the area the fires have been burning through hasn’t been touched by fire for many years and has become overgrown. Fire managers have allowed the fire to burn to consume the fuel buildup as well benefit area’s fire-dependent ecosystem. “The option to allow some naturally ignited wildland fires to provide benefits to the resource instead of suppressing them will give Dixie National Forest and Bryce Canyon National Park fire management personnel another tool to use in their goals to restore and manage future fires,” the release states. The fires are reported to have increased in size due to hot dry winds pushing the flames to fuel-filled areas. A hotshot crew is working the western edge of the Riggs Fire to keep it from continuing toward Rainbow Point and will set up sprinklers around the area’s infrastructure. Helicopters are being used to drop water on the fire. There are 54 personnel and various resources assigned to the Riggs and Lonely fires. All visitor facilities, services and businesses in surrounding communities are not impacted by the fire and remain open. Within the Dixie National Forest, the Grandview Trail (066) from the Willis Creek junction to Lower Podunk is closed. In Bryce Canyon National Park, the Riggs Spring Loop Trail is closed, including the connector trail from Riggs Springs to the Grandview Trail. The Under-the-Rim Trail is also closed from Agua Canyon to Rainbow Point. These trails are temporarily closed for safety and welfare of the public. Available parking at the Rainbow Point parking lot has been reduced to accommodate firefighting equipment.